A Colt on the Roof? 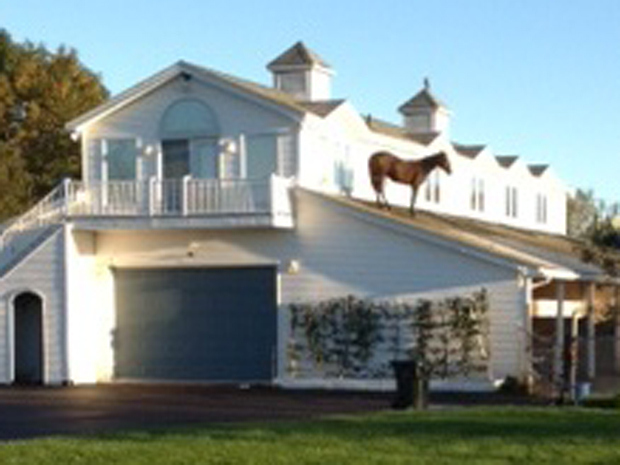 That’s what the photo shows: yearling thoroughbred Must Win patiently standing on the roof of the barn. Pat and Stephen Downey thought the photo was doctored at first, but their barn bore witness to his adventure, with multiple manure piles and a hole where the colt’s hoof punched through. Stephen’ brother, Archie, snapped the photo, then coaxed the baby down. He’d never been handled, so Archie first tried to lure him down, but that failed. Then Archie got behind him and gently shooed him toward the rear edge. At last, Must Win finally took the dare and jumped down to the earthen ramp he’d used to climb up.